Smartphone has facilitated e-learning, especially when it comes to learning new languages. Many applications are offering new ways creatively. Among these apps, I have tried and liked is, Lingbe is a great application that is completely different from other applications. This app gives you the ability to talk to other people in order to practice what you learned. The best way to learn and improve a language is to practice on a daily basis with native speakers and other users that are practicing the same language. It doesn’t matter if you want to learn, improve or just practice Spanish, Portuguese, French, Italian etc.. in Lingbe community you will always find someone available that will help you practice the language of your choice through free voice conversations. All you have to do is press the call button and we will find you a person who will help you learn and practice the language of your choice in that very moment. After the conversation you will receive feedback in terms of grammar, pronunciation and fluency so you can always see how fast you are learning and progressing. Also, If you had a pleasant experience give your practicing partner a like after the call. If they like you back then you will both have the ability to chat and practice again at any time. Just as if you were chatting with your friends in a regular messaging platform. The application encourage you to help other users that want to learn your mother language as collaborators. 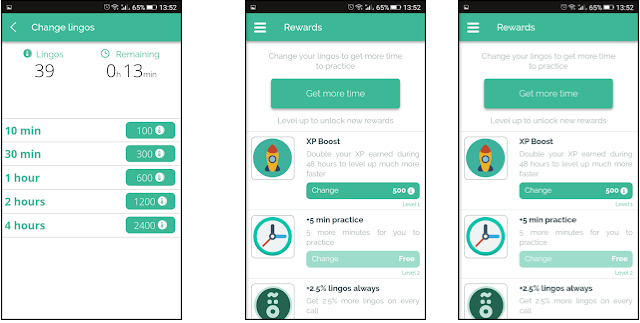 This way, you will earn credit (lingos) that you could use to practice the language of your choice for free. 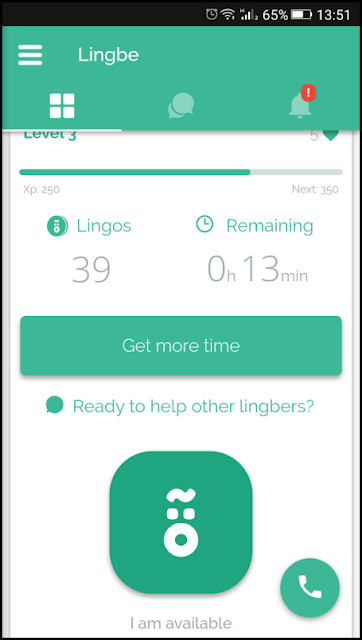 Also, by helping other users you will level up faster and you will unlock exclusive rewards and features inside Lingbe. This is how our language exchange community works!